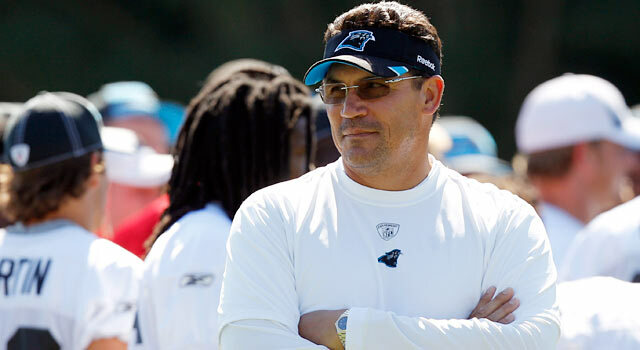 Published: Aug. 10, 2011 at 06:20 p.m.
Coach Ron Rivera takes over a Panthers team that had the worst record in the NFL a year ago. Steve Wyche recently visited Panthers camp in Spartanburg, S.C. Here's what he saw. 1. Ron Rivera is earning respect. Besides coming in with a positive approach after a woeful 2-14 season, the new coach has gained support from his players by not being overbearing and trying to establish himself as the team's front man. Rivera has been blunt but consistent with players in not bringing up the franchise's recent history -- bad or good. "I've been here since '03 and we've run the gantlet of success and failure," said tackle Jordan Gross, who admitted he loved playing for former coach John Fox. "(Rivera) is talking about a new start and building something here which is exciting for me. It's like a brand new organization. "I told Steve (Smith) when he was talking about getting traded that we are fortunate because we get to stay at home but go to a new team at the same time." 2. The Panthers are getting more bang for their bucks. Carolina re-signed or extended a number of core veterans, including RB DeAngelo Williams, LB Jon Beason, LB Thomas Davis, LB James Anderson and DE Charles Johnson. The effect of the heavy spending goes far beyond simply retaining some of the team's best players, according to Gross. "It's huge (because) it gives guys a sense of belief in this organization, and a sense of belonging," Gross said. "When (Julius) Peppers left that was a big blow to the organization and to the locker room. It was like, 'If he's not staying, who can?'" Who else would you want on your team? They come back the next year and sign DeAngelo, C.J., the linebacking corps. "You want to draft and have your drafted guys turn into starters and stars in the league. To build a long-lasting team you got to keep those guys on the roster. Guys are more in tune with that logo on their helmet now than just the name on the back of their shirt." 3. Please send help for Steve Smith. Before breaking his finger, Smith had been stellar on and off the field during training camp. His sure-handedness and play-making skills havenât trickled down. Second-year player Armanti Edwards is much better than he was as a rookie and will be working a lot out of the slot, but David Gettis and Brandon LaFell, according to a team source, have been inconsistent and have been told to step things up. Former Chargers wide receiver Legedu Naanee looks like a pretty solid lock to eventually be the No. 2 receiver. 4. The defensive end rotation is strong. Johnson was recently re-signed to a six-year, $72 million contract after his strong 2010 season. He will start at right end but will flip to the left side depending on matchups. Though the coaching staff is impressed with second-year player Eric Norwood, who is listed as the starter at left end at this point, the plan eventually is for Greg Hardy to be the starter when the regular season opens. Hardy was in a motorcycle accident before training camp and suffered several skin lacerations. He could return soon but the training staff doesn't want to risk infections. The three-man rotation of Johnson, Hardy and Norwood has coaches excited. They're hoping Everette Brown steps up, but he could just be limited to pass-rushing duties. 5. Jon Beason is staying put. Rivera and his staff thought seriously about moving Beason, the veteran Pro Bowl middle linebacker, to the weak side. That was until they spoke to Beason, who told them he would play wherever they wanted him to but when he lined up in the middle âthings slowed down.â The Panthers considered using Dan Connor in the middle but when Beason said what he said, then went out in training camp and showed how cerebral and good he was, a decision was made quickly that he would stay in the middle. Connor has been getting a lot of reps in practice and likely will in the preseason as Beason has tendinitis in his foot and is not going through a heavy workload. 6. The offensive line is a strength. Right tackle Jeff Otah, who missed all of last season after knee surgery, is still working his way into form. Rivera said he's expecting big things from Otah. Center Ryan Kalil is excellent and is the next player likely to receive a contract extension. He's currently under the franchise tag. The question is at right guard. Geoff Schwartz is the projected starter but he's down with a hip injury. Mackenzy Bernadeau and Duke Robinson provide adequate depth. Travelle Wharton is established at left guard and Jordan Gross is among the better left tackles in the game. » Cam Newton. When I mentioned to Rivera the work ethic of the other quarterbacks in the NFC South -- Drew Brees, Josh Freeman and Matt Ryan -- the coach immediately said Newton might belong in that group. One of the things that's been most pleasant about Newton, according to Rivera and others with the team, is that he works. The rookie is putting in overtime and teammates are recognizing. » Sione Fua. The third-round pick is going to start the preseason opener at nose tackle and he's already established himself as a rotational player. He's athletic, which is what Rivera wants up front. Still, Carolina is going to have to use a lot of players at defensive tackle to effectively slow down things in the running game. Rookie Terrell McClain also has turned a lot of heads as the three-technique defensive tackle. » Derek Anderson. Though he's not new to the league, the quarterback has been a good veteran to have in camp, Rivera said. Anderson's still learning the system but he's helped Newton and Jimmy Clausen understand some of the nuances of practice, like executing in seven-on-seven drills. Anderson's the No. 3 QB but Rivera told me they like the security of having him on the roster. » Kealoha Pilares. Sleeper alert! This receiver/return man could be a dark horse to crack the receiver rotation. The rookie from Hawaii has âflashed,â several times, according to Rivera. During the practice I witnessed, he did more than flash. The slot receiver is shifty, quick and determined. Heâs definitely someone to keep an eye on. "I was a nobody before I got the contract and I'm going to keep playing like I'm a nobody." --Charles Johnson, who signed a six-year, $72 million deal to stay in Carolina after posting 11.5 sacks and 62 tackles last season. 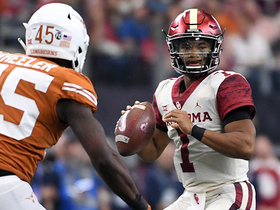 The coaching staff said they're going to play the quarterback who is most game-ready. Frankly, that's Anderson, but he's not going to get the nod. My take is that if Newton looks like he can handle the pressure and deal with some of the in-game adjustments and play calls in the preseason, he'll be the starter Week 1. From Matt Ryan to Sam Bradford to Matthew Stafford, coaches have said what Rivera is selling about playing who is the most game-ready knowing the goal is to get the rookie quarterback ready to start from the outset. I've got a feeling that will be the case with Newton.